The scammers at Direct Publisher are at it again, this time with the Commercial Register Canada scam which attempts to dupe small business owners out of $1414. This is starting to gather pace and I have seen a noticeable increase in the amount of people contacting me regarding the scam. 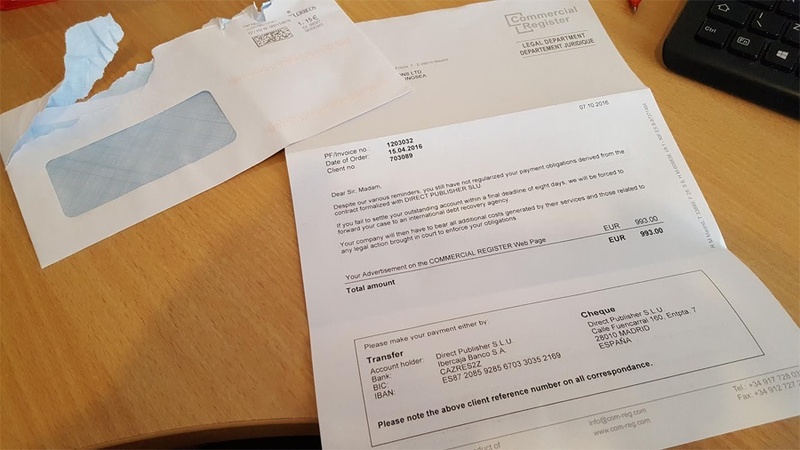 I’ve written in the past how the Commercial Register Scam has been used to extort money from UK business owners, and now the same company have widened their net to Canada. The scam is designed to dupe genuine business owners into thinking they are legally obliged to complete a form. The letter will arrive looking official, asking the business owner to update the details of their company and return the letter. What many people don’t realize is that the reverse of the letter has a number of terms and conditions on it, and by signing the letter, the business owner then agrees to the terms of the ‘contract’. Part of this ‘contract’ is that the owner agrees to pay $1,479 CAD to advertise on the scammers website. 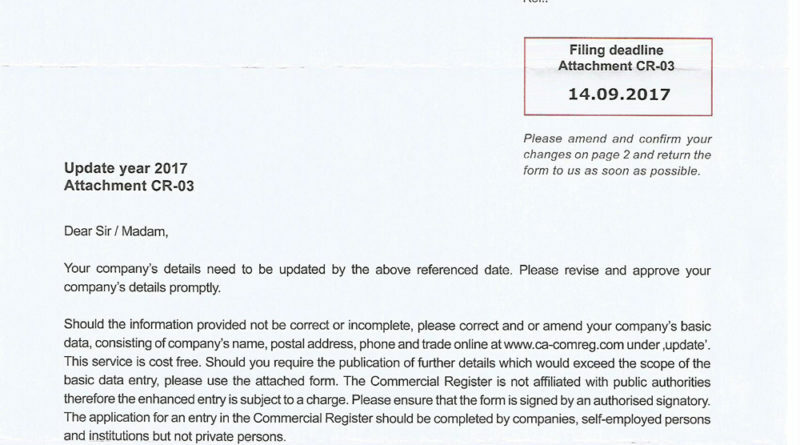 I was contacted by Canadian business owner Cathleen Fillmore who said that she began to complete the form but quickly realized that it wasn’t genuine when the scammers omitted her business registry number. I was also contacted by Donna, another Canadian business owner, who confirmed that the letter was marked ‘Commercial Registration Canada’ and the return address was to Direct Publisher in France. She says that DP are getting very clever and this document actually looked legit. The most important thing is not to return the letter. If you have returned the letter, don’t enter into any correspondence with Direct Publisher. They will threaten to sue you. They will send you letter from supposed law firms (none of which will be genuine). They’ve never taken anyone to court as they know that their contract is unfair. You certainly shouldn’t pay anything. Thank you for posting this article….I also receive this form asking for my business information. Very official looking and a deadline for compliance….4 weeks ago I was about to drop it off in the mail when I stopped myself and said why don’t you read the form a bit more since they were asking for information that the corporate registry should already have. So today I thought I will google to see what this is all about since there was no phone number on the form which is very unusual for any government correspondence. And to my dismay I found your article. You saved me from this SCAM…..THANK YOU!!!! I am going to report this to the government since there should be some public service information from the government with regards to this. I dodge a big one and to think that I always saw myself and savvy and on top of things it’s frighten to think how so close I came to a different outcome had I not taken the time to use google and found your post.